Deciding on equipments or accessories for a kitchen is quite a thoughtful process. With numerous options of everything in the market, selecting the most functional and durable is quite a tough decision. Kitchen sink is no different and requires quite a thought with regards to type of materials, design, color and above all its functionality. With all that elaborate cooking of delectable dishes comes along a lot of cleaning work, which is why you need a sink that should not only accommodate the numerous dirty dishes (without them toppling over each other and eventually falling onto the floor! ), but also be easy on maintenance. Cast iron kitchen sinks are one choice of sinks that help you relax on this front and carry on your cleaning work effortlessly. Why should you go for cast iron kitchen sinks? Cast iron kitchen sinks are extremely durable, fairly easy to maintain, but heavy in weight. They are made from an iron alloy with roughly 95% iron and 5% silicon. For home use they are generally coated with a porcelain coating material, called enamel. 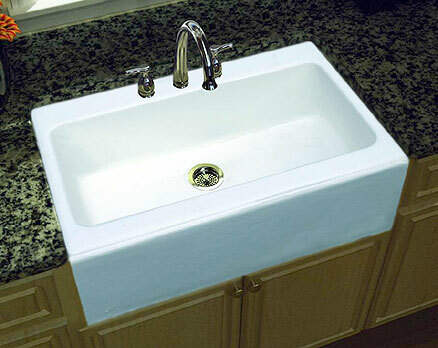 It is the enamel coating that gives the sink its color, design, and finish. Such enameled cast iron kitchen sinks are highly resistant to heat… around 1000 degrees. That allows you to slip hot dishes right onto the sink, when required, without having to bother about any damage. They are quite easy to maintain also, as they are coated with stain resistant material, so no more scrubbing with abrasive cleansers or steel wool. A soft sponge is enough to keep it clean. Undermount cast iron kitchen sinks are heavy in weight and need care during installation. Hence it is important that you measure the countertop hole dimensions properly before selecting a sink for it. An undermount cast iron kitchen sink requires firm and solid support because of its heavy weight. It would require firm securing from underneath. The base cabinetry that supports it may require modifications to provide a strong and secured support. If you are not comfortable or confident of installing your undermount cast iron kitchen sink yourself, you can always consider having the contractor install it for you. Choosing the color of cast iron kitchen sinks depends on how clean you can keep it on a regular day to day basis. Black cast iron sink would be easy on cleaning as black color nicely hides the water marks or any other food stain. However, scratches are bound to show. Compared to this, a white cast iron sink would need immense care (everyday cleaning) and would show spots and stains from food items immediately. However, scratches will be less visible, as white can match and hide with the surface below the enamel. It is interesting to know that during postwar period of 1946 to early 50s, a lot of white-enamel-on-cast-iron sinks were made and used in the farmhouse kitchens. Such antique cast iron kitchen sinks were famously made and marketed by big names like Kohler, Youngstown etc. They were huge in sizes and were almost as majestic as ones we see in the market today. However, such sinks are rarely used today due to space constraints of the kitchen. But even today, if you do want to own one such prized accessory for your kitchen, you could research on the Internet for such vintage cast iron sink manufacturers. Vintage cast iron kitchen sinks have their old world charm but need a good amount of aligning with the countertop hole. This could be cumbersome considering the size and weight of the sink. Cast iron kitchen sinks are a great choice as per their durability, outer look or finish. They can very well hide the water stains and are easy to clean and maintain. However, you need to consider few points to keep your cast iron kitchen sink last long. The porcelain coating can chip off if hit hard by some utensil or due to cleaning with an abrasive cleanser etc. If the coating chips off then the underlying iron can begin to rust. Lighter colored cast iron kitchen sinks are bound to get scuff marks from heavy pots and pans or even tea bags (over a long time). So care needs to be taken to keep them stain free and scratch free. Gentle care will ensure a long lasting cast iron sink for your kitchen. Click here for the best deals on cast iron kitchen sinks.